Nearly one eighth of all people living with HIV live in South Africa. This statistic is shocking enough but what are the experiences of these people living with HIV. So often they are ignored, the research and healthcare debates focus on the figures and medical details of HIV, on how the virus spreads and the symptoms are, not how it affects peoples lives. Corinne Squire is Co-director of the Centre for Narrative Research, at the University of East London, and over a nearly four period she visited South Africa, interviewed and then re-interviewed a group people living with HIV. 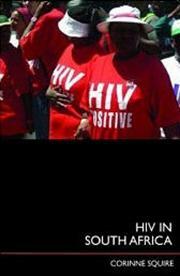 Most of these people gave a different prospective of living with HIV then we have here in the West. Her findings, published here in HIV In South Africa, make for both sobering and interesting reading. She found a group people on one hand facing terrible social and political prejudice but also forming their own personal and social support networks, often networks that we would be surprised at in the West. She also put these findings into the broader African and international political climate, not just seeing this as a South African �problem�. For anyone working in HIV prevention this book makes fascinating read. Corinne Squire has concentrated on peoples� experience of HIV, rather then a catalogue of their medical symptoms, and so gives a different insight into living with HIV, more then just how people cope with their symptoms. It also made sober reading for this British reader. We need more works like this, with this degree of insight, into all aspects of living with HIV. Peoples� experiences, when collected with the skill shown here, can help us in developing the services people really need.